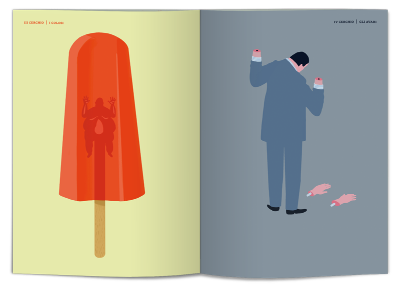 In the “Sedicesimo” n. 28 published by Edizioni Corraini the sharpest stroke of Emiliano Ponzi’s lastest work is the idea of exploring the Hell through the filter of contemporaneity and universal icons, to revisit by flashes of Dante’s Inferno circles. Dante’s “sleep” procedes in Ponzi’s narration by visions. Daily nightmares drown in the flat background colours of each image. A suffocating uniformity of colours cutting the ribbon of time and freezing the figures in the eternity of punishment. In the ‘Sedicesimo Inferno” Emiliano Ponzi creates a “punishment of colour” that kneads and washes the human feature of the damned in which it only emerges the identity of their role in society or history. 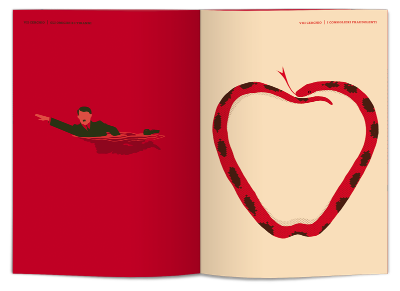 “Inferno” is the 28th “Sedicesimo” of the prestigious book series of edizioni Corraini that hosted the most important signatures of art, design and communications, such as Steven Heller, Frank Chimero, Steven Guarnaccia, Italo Lupi and Giulio Iacchetti. To see more of Emiliano’s work go to his rep’s website or Altpick page. This entry was posted in Altpick, Illustrations and tagged Dante, Edizioni Corraini, Emiliano Ponzi, Inferno, magnet reps, Sedicesimo. Bookmark the permalink.